Virginia Board of Physical Therapy 5.0 (Type 1)–Please check with your state board for approval as most physical therapy boards will reciprocate approval for continuing education. The American Academy of Health and Fitness (BOC AP#: P3645) is approved by the Board of Certification, Inc. to provide continuing education to Certified Athletic Trainers. This program is eligible for a maximum of 5.00 Category A hours/CEUs. Nutrition for Special Dietary Needs™ home study continuing education course addresses the nutritional needs and issues of, and exercise prescription guidelines for children, adolescents and older adults. It identifies the impact of nutrition and physical activity on the physiological changes with menopause and during pregnancy and lactation. It distinguishes different types of vegetarianism and explains the pros and cons of vegetarianism. It also distinguishes between overweight, obesity and healthy weight. Methods for assessing body composition, how to calculate energy needs and dietary guidelines are presented. The role of dietary supplements in weight loss, plus the role of aerobic exercise and resistance training in promoting weight loss, are addressed. The impact of nutrition and the importance of exercise and physical activity in managing Diabetes Mellitus are explained. The general principles of treating eating disorders and weight gain recommendations, along with nutrition and exercise prescription for the treatment of eating disorders are discussed. And, ways that the body can gain or lose heat in varying environments and the physiological changes that occur are described. This course is offered to you in a distance-learning format providing research based continuing education for health and fitness professionals who wish to dramatically increase their knowledge about nutritional needs, nutritional issues of and exercise prescription guidelines for special populations; including children, adolescents, older adults, with menopause, during pregnancy and lactation, the overweight and obese, diabetics and those with eating disorders. 1. Explain the nutritional needs, energy requirements, and nutritional issues of children and adolescents, plus the importance of physical activity for children and adolescents. Explain and apply the exercise prescription guidelines for children and adolescents. 2. Explain physiological changes and nutritional needs changes with aging, the interaction between common nutrients and medications, plus the importance of exercise and physical activity for older adults. Explain and apply the exercise prescription guidelines for older adults. 3. Identify and describe the physiological changes, common symptoms, common diseases associated with menopause, as well as the impact of nutrition and physical activity on the physiological changes, symptoms and diseases of menopause. Explain and apply the exercise prescription guidelines for menopausal women. 4. Explain the physiological changes, changes in energy, nutritional related issues and needs during pregnancy and lactation, plus the benefits of exercise and safety considerations for exercising during pregnancy. Explain and apply the exercise prescription guidelines for pregnant women. 5. Distinguish between different types of vegetarianism and explain the benefits of vegetarianism, as well as the general nutritional concerns associated with vegetarianism. Explain and apply physical activity considerations for vegetarians. 6. Distinguish between overweight, obesity and healthy weight and explain four different methods for assessing body composition. Identify and explain the components of energy expenditure and how to calculate energy needs. Explain dietary guidelines and recommendations and the role of dietary supplements in weight loss, plus the role of aerobic exercise and resistance training in promoting weight loss. 7. Distinguish between Type I, Type 2, and Gestational Diabetes Mellitus. Explain the relationship of metabolic syndrome to diabetes. Explain the role of nutrition the importance of exercise and physical activity in managing Diabetes Mellitus. Explain and apply guidelines for exercise for people with diabetes. 8. Distinguish between types of eating disorders and disordered eating. Explain the general principles of treatment of eating disorders and the weight gain recommendations and nutrition for the treatment of eating disorders. Explain and apply the exercise prescription recommendations for clients with eating disorders. 9. Describe four ways that the body can gain or lose heat in the environment and the physiological changes that occur in heat and humidity, extreme cold, and high altitudes. List and define common heat-related illnesses and the dangers of exercising in extreme environments, including heat and humidity, cold and high altitudes. Electronic format — The Nutrition for Special Dietary Needs™ certificate package with online test includes the eBook version of the 200-page Fitness Nutrition for Special Dietary Needs by Stella Lucia Volpe, Sara Bernier Sabelawski, Christopher Mohr (accessed through Adobe Air with instructions for downloading Adobe Air*) and a 64-page workbook provided in PDF format. Instructions for completing the multiple-choice online test and obtaining CECs are also included in PDF format. Note: This course package is made available for immediate access and download after purchase. All materials for this electronic format course are available electronically. Nothing is mailed. 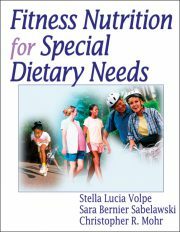 Hard copy format — The Nutrition for Special Dietary Needs™ certificate package with online test includes the 200-page book Fitness Nutrition for Special Dietary Needs by Stella Lucia Volpe, Sara Bernier Sabelawski, Christopher Mohr and a 64-page workbook. Instructions for completing the online test and obtaining CECs are also included. Note: Course materials for this hardcopy format program are sent through USPS Priority Mail. Orders shipped to other countries may be subject to customs charges and/or other taxes and fees charged by authorities in the destination country. Any customs charges and/or other taxes and fees charged by the destination country are the responsibility of the customer. We are unable to advise the exact charges that may occur as they vary from country to country. If you have questions, please contact us and we will share our experience for your specific country. 2017-12-04 13:35:16 Michelle Kennedy NSCA Strongly Agree Strongly Agree Strongly Agree I am an in home personal trainer so adding a nutrition aspect to my training will be a great benefit for my clients There were two "answers" that might need to be adjusted. Q15 one of the answers was "Both A and B" but it was placed in the "A" spot so even if another answer was also correct choosing Both A and B would not have been correct.